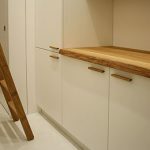 Integrated in the context of the historical center of Milan, few steps away from the famous Arco Della Pace, this apartment is the result of a meticulous restoration to join two separate units and later accomplish a complete design project with a high attention to detail.The division of this space is clear from the entrance where originate two distinct areas, on the one hand the living area and on the other hand the sleeping area, this has the purpose to emphasize the previous subdivision in two different units. On the right there are two bedrooms with bathrooms, furnished with warm and comfortable elements, matched with the light colors used for both fabrics and walls. The ceramic stone effect used in the baths has the purpose to emphasize even more the feeling of relaxation and harmony. On the left we find the living area that, such as the bedrooms, has been designed in a classical style, by mixing some modern, customised furniture to others who are symbols of international design. In both areas some distinctive elements of the original building have been preserved and highlighted, such as beams, in this case painted white like the rest of the ceiling. Dominant element of the interior is the staircase, designed in a way that gives the feeling of floating in the air. The features of this component have been determined both by the choice of avoiding to “break” the living area into two areas, and by the wish to create a unique design element. The first steps are made by parquet covered full volumes, whereas the main body, lifted from the floor, is what gives a great feeling of lightness. This happens thanks to two glass walls anchored to the base, making it self-supporting. These steps are also coated with the same parquet used for the floors, but they’re more interesting because they give the feeling of “passing” from side to side the two glass walls.The ramp leads to a covered terrace, obtained by the attics of the two units. 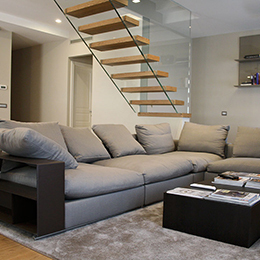 This space gives the apartment a unique added value allowing a direct view of Arco della Pace.